David Cameron seems to have been channelling the spirit of Margaret Thatcher in the opening weeks of the 2015 election campaign. Speaking to an audience in Bristol, he said: “We know that there is no such thing as public money – there is only taxpayers’ money”. As the Independent pointed out, this was a word-for-word quote from Thatcher’s speech at the 1983 Conservative Party conference. Voters are also being reminded of the 1983 election by the news that the battle bus used by Thatcher in that campaign is to be sold. That year, Thatcher took a long and sprawling tour of the nation in her “superbus”. The journey was meticulously planned. Thatcher later explained that the goal was not to just meet as many people as possible but also to secure the best publicity. She admitted in her 1993 autobiography that travelling in the bus was always going to be tiring but that this was how the best press and television pictures could be achieved. This was the key to the entire 1983 campaign. Thatcher’s advisers decided that all efforts should be geared toward television and she had no problem with that at all – despite her protestations that she “disliked the way elections were being turned into media circuses”. Communication as time went on, became one of her most pressing ambitions. What she admired above all about Ronald Reagan was his ability to get his message across. She envied that. To emulate it she was willing to try almost anything that the media men came up with. In January 1983, private opinion polls conducted by the Conservatives identified the personality and leadership qualities of the prime minister as by far the greatest asset they had – a remarkable resurrection given the public dissatisfaction with her before the Falklands War. That’s when the campaign strategy kicked in. In the four months before the election was announced, Thatcher underwent 16 lengthy television interviews. She also threw open the doors of Downing Street to the cameras for the first time in her tenure, for a documentary for ITV entitled “The Woman at Number Ten”. The broadcast included a tour of the most interesting rooms in the PM’s residence. In the blue room, Thatcher told of how she had all the Italian paintings removed, to be replaced by portraits of great British heroes such as Robert Clive, the Duke of Wellington and Admiral Nelson. We were transported back to the golden age of empire. The whole programme was little more than an advertisement for Thatcher’s leadership and patriotism – and it’s easy to see why. Thatcher’s government was most popular in the aftermath of the Falklands War. By the time the Argentinian forces finally surrendered, 84% of the British public said they were satisfied with the way the government had handled the situation. Almost half said their opinion of Thatcher had gone up during the Falklands situation, and only 7% that it had gone down. The last day of campaigning in 1983 was especially designed to evoke memories of the Falklands victory. Central Office provided four military helicopters to fly the press and Prime Minister to the Isle of White. They landed against the backdrop of a Union flag flying on the hangar doors of the British Hovercraft Corporation. 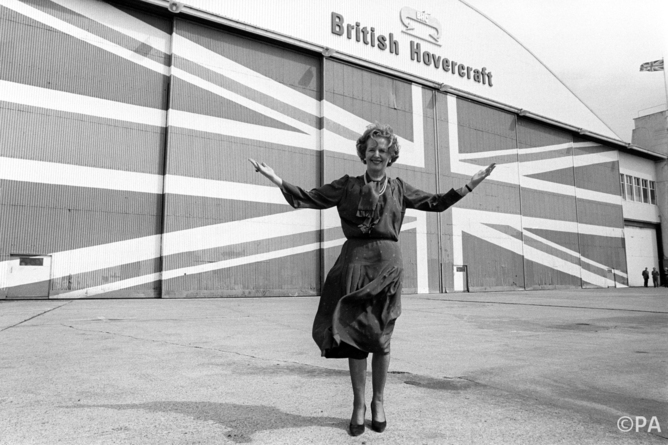 Thatcher was then photographed with arms outstretched in front of the flag, before inspecting a military hovercraft. It was all heavily symbolic. Since the end of the war, the public had been constantly reminded about Thatcher’s pivotal role in the British victory in the Falklands. The election campaign saw no let up. Then, as now, the Conservatives excelled in the art of political persuasion. At the launch of their manifesto on May 17, the press room had a unique feature. There was a choice of curtains for the backdrop. One set was light blue. The other dark blue. The aim was to change the mood of the press conference from day to day. One of Thatcher’s advisers Christopher Lawson (previously a director of the company that produces Mars bars) had pondered on the choice of curtains for months – considering the opinions of five industrial psychologists and behavioural psychiatrists. Every singularity was part of the bigger picture the Tories sought to present. Everything was managed and very little was spontaneous. Thatcher was supreme in front of the cameras – every evening news bulletin would see her driving a dump truck, or sorting peanuts in a factory, or operating a sophisticated computer system. US political influence was everywhere to be seen. Thatcher’s rallies resembled presidential conventions, with warm up music and Union flags provided for everybody to wave. The events were all ticketed, invitation only affairs. This produced audiences of devotees who ecstatically received addresses and helped portray the Prime Minister as powerful and confident. 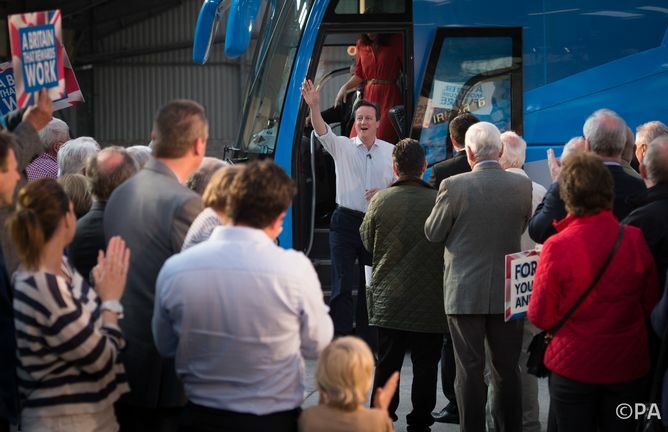 Now in 2015 we find Cameron blazing into a barn in Cornwall, against the backdrop of his very own battle bus, towards a crowd of assorted acolytes. Why change a winning formula? Despite the careful engineering of the 1983 campaign though, it’s generally considered that the Tories never faced any meaningful threat from the opposition. They even reportedly cancelled all advertising for the last four days of the campaign because they were so far ahead there was no point wasting money. Labour was running an old-fashioned campaign that failed to take account of the television age. Michael Foot, the Labour leader at the time, had proven skills as a parliamentarian but they were unsuited for modern political communication. Foot had spent the best part of 50 years speaking without notes and now, for the purposes of the campaign, had to use prepared texts. During his addresses he would let paragraph run into paragraph and would not tailor his words for the cameras. As the super-confident Thatcher triumphed in front of rapt crowds, televised extracts showed Foot hunched over a lectern, obviously reading from notes, his speeches generally received in silence. 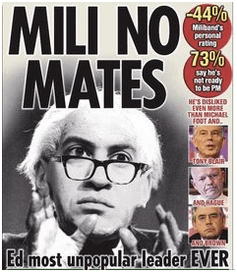 It’s fair to say that in 2015 the Mail and the Sun have sought to tarnish Miliband with Foot’s reputation – in November 2014 the Sun ran it’s Mili no mates spread. The Sun harkens back to ‘83. 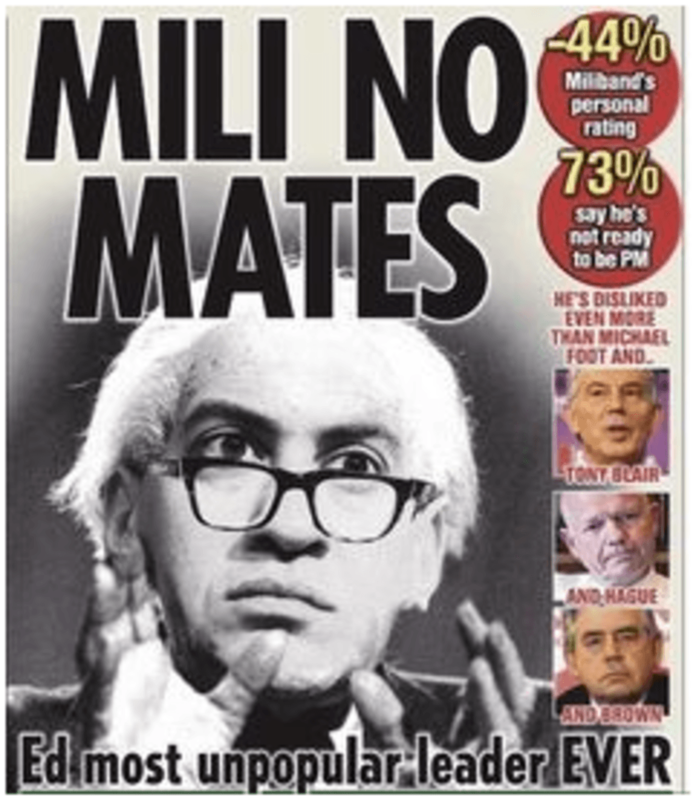 Britain doesn’t want him said the editorial and, furthermore: “His own party doesn’t either.” To emphasise the point, next to an announcement stating that “Ed is the most unpopular leader EVER” was a picture of Miliband in a Michael Foot wig. Foot being, in the Sun’s view of course, the ideological father of the current Labour leader. Voters are meant to see the two of them united ineptitude and equally as unelectable. 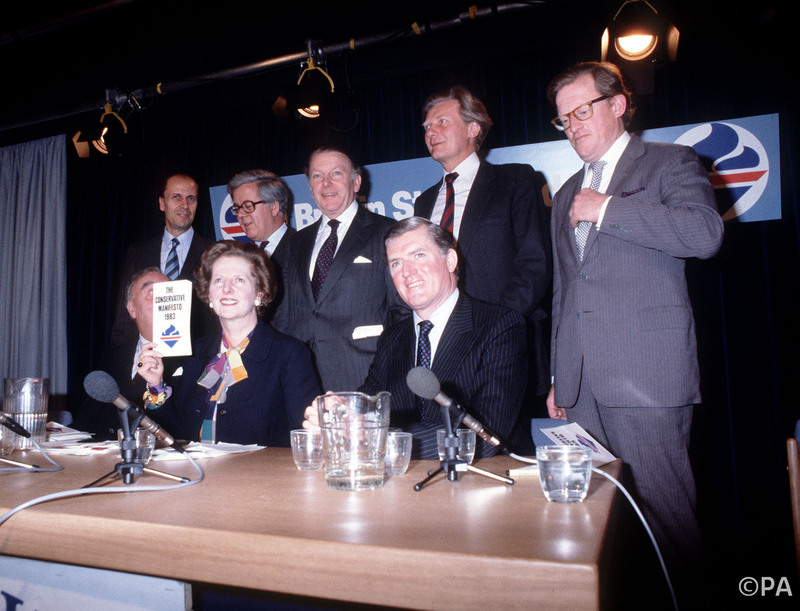 The Conservative victory on June 9 1983 was one of the most convincing in modern political history. With a majority of 144 seats, the government had a powerful mandate from the electorate. The Tories went on to spend the rest of the 1980s using this mandate to introduce policies that would alter the cultural, economic and social fabric of Britain. For the Labour party, 1983 was a complete disaster. The party was practically obliterated in South England, occupying as it did just 3 seats of the 182 outside of London. There was also a collapse in core working class support with even an 8% swing to the Conservatives from trade union members. This was the worst defeat since 1918 with fewer seats held than at any other time since 1935. From this point for Labour, though complete recovery would take 14 years, things could indeed only get better. Things are nowhere near as bad for Labour now. Pollsters have them neck and neck with the Conservatives, some indicating a small Labour lead. The days of humiliation are long gone but the effects of the 1983 election continue to be felt. This post first appeared here in the Conversation.